New Melson- Leith EP out! 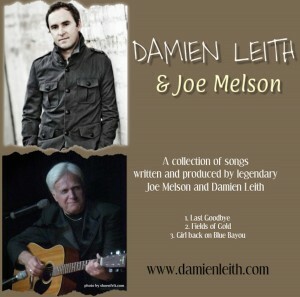 Joe and co-writer Damien have been at it again with three new releases on one EP simply entitled “Damien Leith & Joe Melson”. You will find these songs styled in that amazing Melson sound. ~The goodbye he wishes he could take back. ~The perfect love, found and lost, that can never be forgotten. ~ A lonely heart reminiscing “Blue Bayou’s” girl and longing for one like her. WOW! What great songs! You’ll want to get them now exclusively on iTunes download them today!